The idea for this exhibition grew out of a continuing interest with the "notion of territory". The participants are all artists I have met on my travels whilst they themselves were "away from home", engaged in fine art research. It is within this ongoing context of interrogation and travel that I would like to introduce the works in this joint exhibition. This implies that the work is contextually fluid and nomadic - open-ended, questioning journeys, rather than closures. The show, therefore, is "a-topic" in that the works resist fixture and examine "territory" through temporality and 'viatorisation' in terms of themes, materiality, personal experiences and artistic navigation. For clearly, spatial perception is transformed when global networks, speedy travel, political, business and weather crunches bring more climates for flight, migration, and a collapse of distance, with yet a stronger awareness of cultural multiplicity. The sociologist Marc Augé talks of a sweeping "net" wherein the knots link us together. Yet, like the junctions on a spatial superhighway these constellate in multi-directions. These videos have that kind of vehicular quality, where the materiality of time itself is part of the issue of the materiality of art and culture today, combined in the personal histories, land politics, physicality, loss, sense of itinerancy, escape or imaginings through which each artist here chooses to address territoriality. For, increasingly, we are told, there no longer is any territory... this has become one of the illusory effects of globalisation. 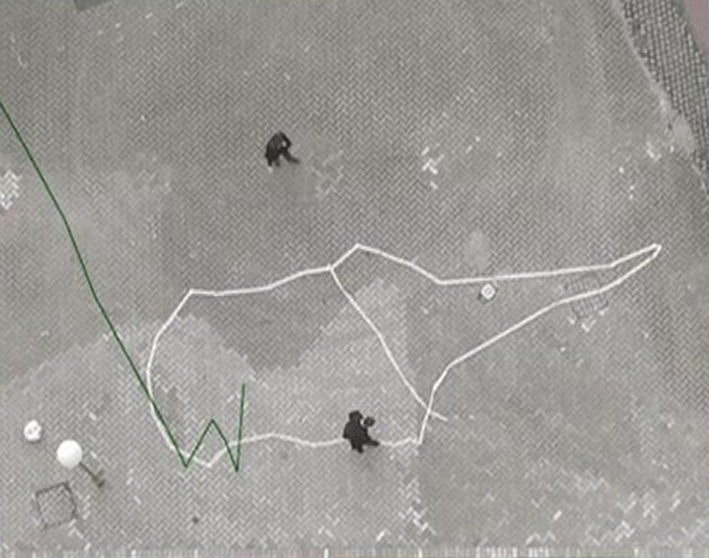 In his recent introduction to Altermodernity, Nicolas Bourriaud observes: 'in a world every inch of which is under satellite surveillance, territory takes the form of a construction or a journey'. 'The exodus' he says is the gestural legacy of modernity leading to the current standpoint of: 'the extreme globalisation of culture'. In the context that art has always been creatively "fugitive", my view is that more than "refugee", the contemporary artist is "avatar" (living transformed realities). My surmise is that territoriality is but "connective transitoriness". The artists here all navigate through different media to explore interdisciplinary practice in their art, and video is but one conceptual departure for them in this show. Reem Bader, Maria Papanastasiou, Sumita Chauhan, Linda Gibson, Leah Decter, Josephine Turalba, Esin Croft. Decter explores territoriality through the 'perpetual palimpsest'. 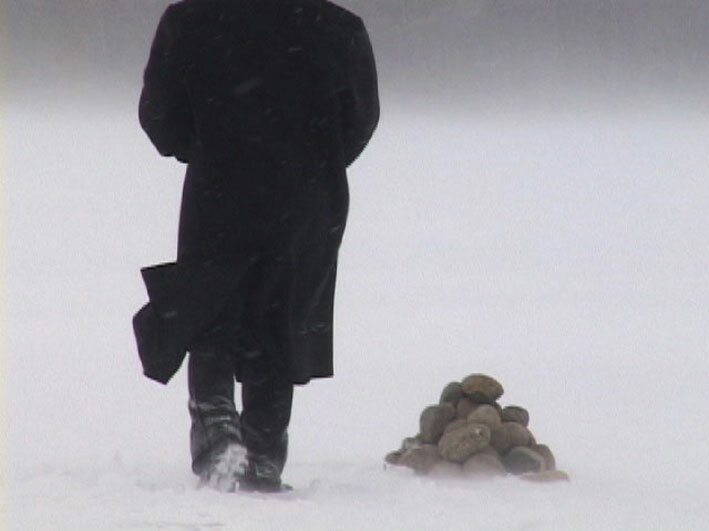 Personal histories and Jewish custom, whereby 'pebbles are left on a gravestone to mark a visit to the dead' are echoed in the ritual loop of laying stone upon stone upon stone as an 'act of remembering'. Leah Decter (b Canada) lives and works in Winnipeg, Canada. She is currently taking an MFA in New Media at Transart Institute at Donau University, Linz, Austria. Interdisciplinary practice includes: installation, video, photography, performance, public interventions, sculpture. Has worked as curator and educator in the arts, undertaken residencies and exhibited widely in: Canada, USA, Australia, and UK. Turalba explores violence as an age-old exchange for power and territorial acquisition everywhere. 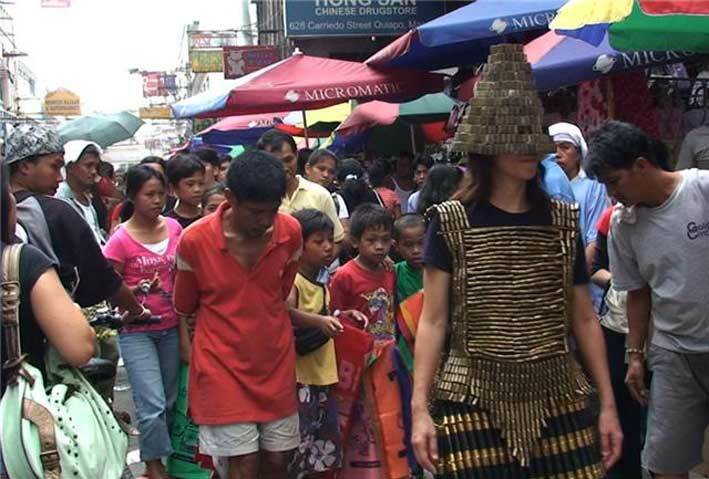 She takes to the streets in her "body armour" - a brass bullet dress - as a way to test tensions between placid reaction and infliction, protection and hostility. Josephine Turalba (b Manila) lives and works in Manila, Philippines. She is currently taking an MFA in New Media at Transart Institute at Donau University, Linz, Austria. Engaged in interdisciplinary practice: jewellery design, video, painting, installation, performance and sculpture. Received international recognition in jewellery design. Exhibited in: the Philippines, New York, Berlin. Croft gives voice to silence. Cultural conflict and the need for escape from: 'the heavy weight of religion' and 'inherent prejudice against women', are translated into iconographic transitions from east to west to parallel 'masks of repression and displacement'. Esin Croft (b Turkey) comes from Istanbul, Turkey and currently lives and works in the UK. Following art & design studies in Istanbul, Turkey, she completed an MA in Fine Art at UCA, UK. Engaged in interdisciplinary art and design, she currently runs a practice focused on ceramic and graphic design, along with showing and creating other work in video, sculpture and drawing. Has shown in Turkey and UK. 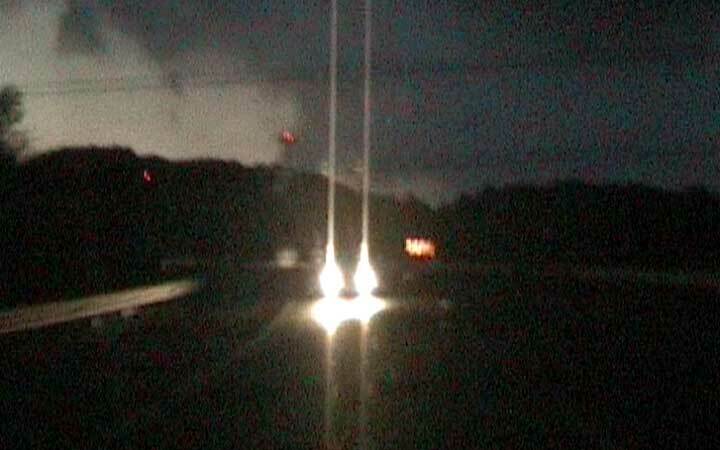 A video shot on the road "away from home", exploring the language of the super highway in which the utopian freedom of overland travel, driving, infinite motorways and anonymity is overshadowed by the satellite gaze of the GPS (Global Positioning System). 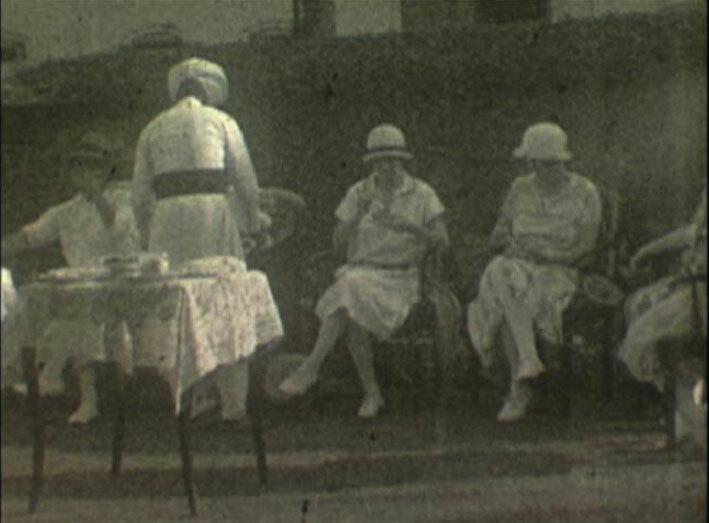 Gibson juxtaposes found footage (a home film and a mainstream film relating to the British Raj of 1920s) to explore the notion of "abroad", of "another", as possible utopian visions of travel and film. This questions the perplexing conundrum of truth and fiction. Linda Gibson (b England) lives and works in Kent, UK. She trained in painting at Goldsmith's in London, and took an MA in Fine Art at UCA, UK moving into mixed media and video to explore the dichotomy between fiction/drama and truth/documentary. Engaged in art education parallel to international practice; recent shows include: London Biennale UK; FA Mus., Malta; Artconnexion, Lille, France. Chauhan examines territoriality through its intrinsic relationship of body to space. Spatial awareness is revealed in the act of stitching space itself. In her words, this 'irrational behaviour of locating and relocating space brings presence of new organic shapes'. Sumita Chauhan (b New Delhi) currently lives and works between New Delhi, India and the UK. Taught art; later pursued an MA in FA at UCA, UK, currently continuing to MPhil/PhD. Interdisciplinary practice includes: sculpture, installations, multimedia. Shows internationally and was resident artist in UK; selected for International Peninsula Art Festival in Taiwan; and AIR programme in Finland. Papanastasiou uses screen as mapping device to plot 'placeless place' and hard fact: Nicosia, Cyprus, 'the only city in the world divided in two parts'. Empathy is personified in the heterotopic mirror-split: 'I am over there, there where I am not.. there where I am absent'. Maria Papanastasiou (b Athens) currently works and lives between Greece and the UK. She finished an MA at the University for the Creative Arts, UK; now continuing to MPhil/PhD in FA. Engaged in multi-media practice including: print media, installation, video. Has shown work in major galleries in Athens and Mykonos; UK and Malta. Works in many private collections in Greece, and in New York. 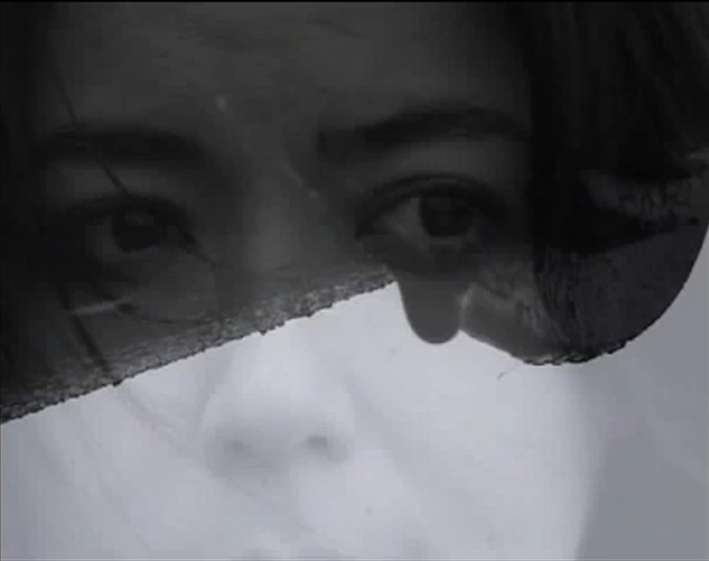 Bader presents herself as protagonist of her own dislocation in this video which she produced whilst "away from home". 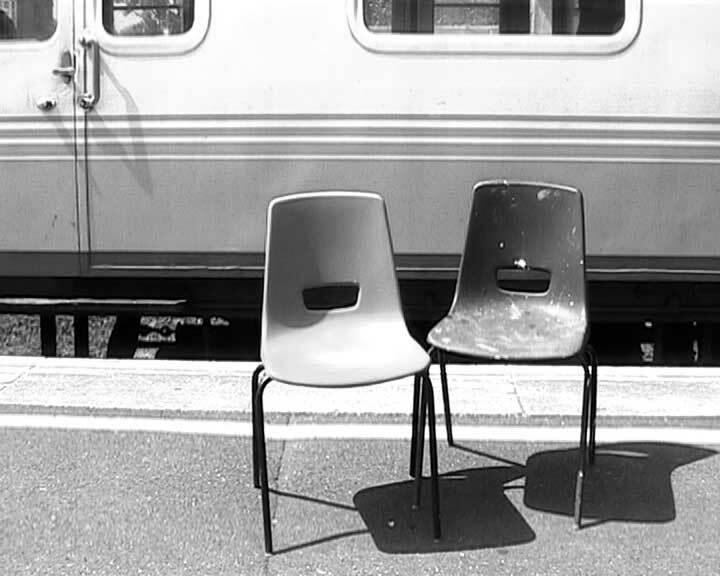 The act of using two chairs to move around with daily life issues portrays the sense of displacement within one's own territory. Reem Bader (b Ramallah) is from Palestine and now lives in Amman, Jordan where she works with the Royal Film Commission. She began her practice as a graphic designer and illustrator, and later completed an MFA at UCA, UK in 2005. Her work has been shown in art exhibitions and film festivals in different parts of the world including: United States, Canada, United Kingdom, Japan, and India.